The Second World War had been won. America seemed to be driving off into the proverbial sunset, leaving its Depression worries far behind and emerging as a shiny, happy world power. And yet, underneath that perfect Brill Cream surface, there was just as much turmoil as ever--only now it was buried down deep where no one could see. Eisenhower-era America was a very paranoid, nervous place, but to really understand and perceive that, you had to look in the place where the nation's zeitgeist so very often resided--the movies. In particular, as they did in so many other periods in our history, genre films best epitomized the mood of the times. In the wake of World War II and the dawn of the Atomic Age, the public was inundated with a plethora of sci-fi based horror cinema. No longer were we being terrorized by fantastical and mythological figures out of folklore--rather, this time around, the dangers came from science, whether that meant man-made or from beyond the stars. The devastating powers of science unleashed were made known to us that fateful day in August 1945, when the city of Hiroshima, Japan was reduced to rubble in a flash. Add to this the all-encompassing fears engendered in us by the burgeoning Cold War, with the whole nation caught up in a panic of potential Red infiltration, and you have a perfect storm of sorts, which would result in a golden age of science-fiction horror. Technology could not be trusted; the strange, the unknown, the outsider, could not be trusted. It was a time of rabid paranoia, and filmmakers were more than happy to step up and take advantage. 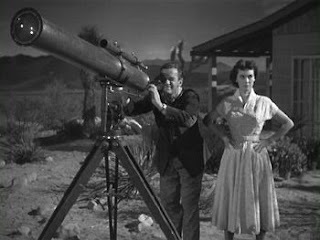 Filmmakers like New Haven's own Jack Arnold, who took his first step into the genre arena in 1953 with the 3-D groundbreaker It Came from Outer Space. At the vanguard of Universal Studios' horror renaissance of the early 1950s, Arnold would go on to direct both Creature from the Black Lagoon and its sequel, Revenge of the Creature, as well as the acclaimed 1957 adaptation of Richard Matheson's The Incredible Shrinking Man. But he set the tone with this, his initial foray into sci-fi horror, and one of the seminal pictures of its kind. Arnold's screenwriter was Harry Essex, the same man who would deliver the script to Creature from the Black Lagoon to him the following year. Arnold also had as his star the earnest and intense Richard Carlson, who also starred in Creature, as well. And although that latter film gets all the press when it comes to Universal in the 1950s, it's entirely possible that this is the better film. Playing on those inescapable Cold War fears, It Came from Outer Space tells the tale of an amateur stargazer (Carlson) who stumbles upon a crashed spacecraft in the Arizona desert and soon becomes the only one aware of the threat once the craft is totally covered in rubble. No one in his small town believes him, and it only gets worse when he begins to see his friends and neighbors being taken over by the inscrutable alien influence of which only he and his put-upon girlfriend (played by the doe-eyed Barbara Rush) are fully aware. It's a classic formula, and one that delivers in spades. Part of the 3-D craze of the early 1950s that also gave us the likes of House of Wax (vying for audiences in the summer of 1953) and Creature the following summer, It Came from Outer Space is engagingly shot by Clifford Stine, who would go on to shoot such epics as Spartacus and Patton. Yes, the 3-D effects are often forced and contrived, as is so much of the 3-D of that era, but it's a testament to the forethought of both Arnold and Stine that the movie works just as well in 2-D.
Carlson and Rush give us performances typical of genre B-movies of this era, but it isn't for greating acting that audiences flocked to films such as this. We also get familiar character actors like Charles Warren as the incredulous sheriff, Joe Sawyer as a philosophical telephone technician and Russell Johnson, a.k.a. The Professor from Gilligan's Island, as his assistant and the first one to be co-opted by the aliens. And speaking of aliens, my what a gruesome and glorious creature design we get here. The story goes that the original design for the aliens was rejected and would later be used for the Metaluna mutant of This Island Earth two years later. 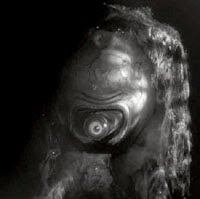 No matter, because the one-eyed, slime-caked, snail-like behemoths created by Milicent Patrick (designer of the the Gill-Man), are far more terrifying. These aliens would have to be among the most memorable of 1950s science fiction cinema, including the unique point-of-view photography that accompanied their scenes, executed by encasing the camera in a clear rubber bubble. The plot, conceptualized by Ray Bradbury, is innovative for its time, portraying the aliens as misunderstood by a mistrusting and primitive human populace--it's the kind of progressive sci-fi thinking that would later give rise to the likes of Star Trek and other such thoughtful, hopeful, utopian sci-fi entertainment. The movie also has so much of what we've come to expect from genre pictures of the 1950s--an exasperated, dire protagonist; a constantly screaming leading lady; and of course, lots of lots of theremin, played by the legendary master of the instrument, Samuel Hoffman. Captain Cruella and I recently had the pleasure of hosting this film as part of The Avon Theatre's Cult Classics series, and despite the poorly reproduced 3-D, it was an experience I very much enjoyed. 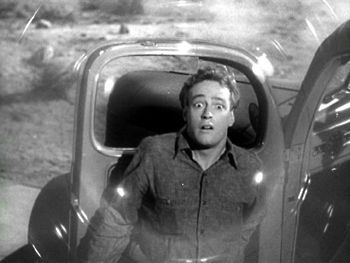 It Came from Outer Space is something of a time capsule--a summation of a very paradoxical time in our history, mixing optimism and hysteria, delivering thrills and chills while also making us stop and think. Universal of the 1950s may have been a shadow of what it was in the 1930s, but this picture is still a whole lot of fun, and proves that the studio could still be counted on to deliver a rollicking good monster movie. Amongst the massive sci-fi horror movement that took the decade of Elvis and Lucy by storm, it is one of the best. I want to bugger Barbara Rush (as the bird was in 1953, not as the bird is now obviously), when that bird was in her early 20`s she was one of the most incredible little sexpots i`ve ever seen. Hamster, you are one of a kind. TRAILER TRASH! '50s Sci-Fi Edition! TRAILER TRASH! Horror Comedy Edition!